This article is about the historian. For the engineer, see Richard R. Hough. Richard Alexander Hough (pronounced how; 15 May 1922 – 7 October 1999) was a British author and historian specializing in maritime history. Hough married the author Charlotte Woodyatt, who he had met when they were pupils at Frensham Heights School, and they had five children including the author Deborah Moggach, the children's author Sarah Garland, and Alexandra Hough, author of the textbook, Hough’s Cardio Respiratory Care. Hough won the Daily Express Best Book of the Sea Award in 1972. After leaving school, he joined the Royal Air Force at the beginning of World War II and received his initial flight training at an airfield not far from Hollywood. He later flew Hurricanes and Typhoons. He also wrote under the nom de plume Bruce Carter. Edward and Alexandra: Their Private and Public Lives, London 1992, Hodder & Stoddart, ISBN 0-340-55825-3. ^ "Richard Hough". Internet Movie Database. Amazon.com. Retrieved 27 October 2009. ^ Leasor, James (18 October 1999). "Richard Hough". The Guardian. ISSN 0261-3077. Retrieved 19 May 2017. ^ a b c d e f g h i j k l m n o p q r s t u v w Hough, Richard (1992). Other Days Around Me. London: Hodder and Stoughton. ISBN 0-340-55221-2. "Richard Hough". Internet Movie Database. Amazon.com. Retrieved 27 October 2009. 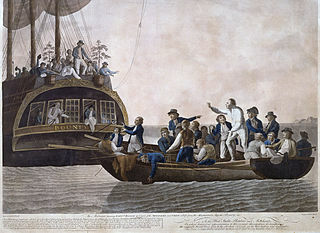 The mutiny on the Royal Navy vessel HMS Bounty occurred in the south Pacific on 28 April 1789. Disaffected crewmen, led by Acting Lieutenant Fletcher Christian, seized control of the ship from their captain Lieutenant William Bligh and set him and 18 loyalists adrift in the ship's open launch. The mutineers variously settled on Tahiti or on Pitcairn Island. Bligh meanwhile completed a voyage of more than 3,500 nautical miles in the launch to reach safety, and began the process of bringing the mutineers to justice. Admiral of the Fleet Louis Alexander Mountbatten, 1st Marquess of Milford Haven,, formerly Prince Louis Alexander of Battenberg, was a British naval officer and German nobleman related to the British royal family. HMS Kelly was a K-class destroyer of the British Royal Navy, and flotilla leader of her class. She served through the early years of the Second World War; in Home Waters, off Norway and in the Mediterranean. Throughout her service, Kelly was commanded by Lord Louis Mountbatten. She was lost in action in 1941 during the Battle of Crete. In addition, Mountbatten served as commander of the 5th Destroyer Flotilla. The seventh HMS Dreadnought was the United Kingdom's first nuclear-powered submarine, built by Vickers Armstrongs at Barrow-in-Furness. Launched by Queen Elizabeth II on Trafalgar Day 1960 and commissioned into service with the Royal Navy in April 1963, she continued in service until 1980. The submarine was powered by a S5W reactor, a design made available as a direct result of the 1958 US–UK Mutual Defence Agreement. Cold, first published in 1996, was the sixteenth and final novel by John Gardner featuring Ian Fleming's secret agent, James Bond. Carrying the Glidrose Publications copyright, it was first published in the United Kingdom by Hodder & Stoughton and in the United States by Putnam. Princess Victoria of Hesse and by Rhine, later Victoria Mountbatten, Marchioness of Milford Haven was the eldest daughter of Louis IV, Grand Duke of Hesse and by Rhine (1837–1892), and his first wife Princess Alice of the United Kingdom (1843–1878), daughter of Queen Victoria and Prince Albert of Saxe-Coburg and Gotha. CHERUB is a series of young adult spy novels written by English author Robert Muchamore, focusing around a division of the British Security Service called CHERUB, which employs children, predominantly orphans, under the age of 17, as intelligence agents. Peter Heywood was a British naval officer who was on board HMS Bounty during the mutiny of 28 April 1789. He was later captured in Tahiti, tried and condemned to death as a mutineer, but subsequently pardoned. He resumed his naval career and eventually retired with the rank of post-captain, after 29 years of honourable service. 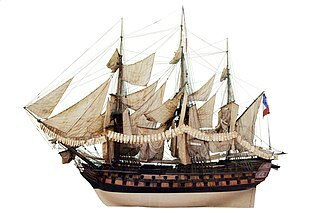 Fougueux was a Téméraire class 74-gun French ship of the line built at Lorient from 1784 to 1785 by engineer Segondat. Hodder & Stoughton is a British publishing house, now an imprint of Hachette. Kydd, first published in 2001, is a historical novel by Julian Stockwin. This first instalment in Julian Stockwin's series of novels set during the Age of Fighting Sail tells the story of young Kydd, who is pressed into service on a British ship in 1793. The book is unusual in that the hero is an ordinary pressed man, not an officer as is most common in nautical fiction.